Need a comfortable desk chair for your office? A Stressless office chair can help. Ekornes Stressless office chairs offer the technology you need to protect your back while you work. Click to View Available Ekornes Stressless Office Chairs Now. What’s missing in most office chairs? Personalized ergonomic support to guard and protect each individual’s back and neck. No one’s body is built exactly the same and neither should their office chairs. With Stressless, you can have an office chair that delivers support based on your body shape and size while offering a complementing design perfect for any office. Ekornes Stressless did their homework to offer you the ultimate in relaxation whether you’re working from your home office or in a large corporate office. Your comfort at work is the main focus for Ekornes when developing their luxurious line of ergonomic Stressless office chairs. Design is not sacrificed for comfort or vice versa. With Stressless, you can have the best of both worlds in your office! 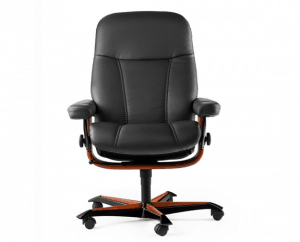 At European Leather Gallery, we carry a wide selection of Stressless office chairs designed to match any office décor. Each chair has one thing in common – they each deliver instant comfort the moment you sit down. The way the chair glides back smoothly offers the perfect support for any position. We recommend giving our Stressless office chairs a try. We promise you won’t regret it.